Many enjoy the convenience of a daily disposable lens like Fresh Day®. As no cleaning is required, simply toss away on a daily basis. My Day™ is the latest in silicone hydrogel technology offering even less awareness of the lens. The MyDay lens is wonderfully soft – softer than other silicone hydrogel, daily disposable lenses – yet they’re easy to insert and remove. 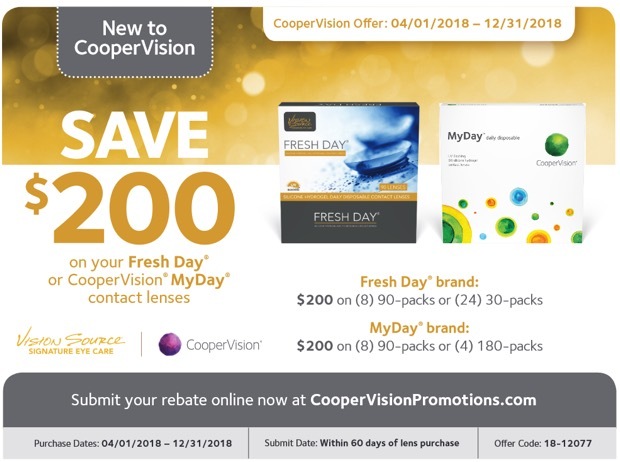 After purchasing your Fresh Day® or MyDay® contact lenses from a participating Vision Source® optometrist, download this rebate and follow the instructions in order to receive your Visa® Gift Card. See rebate for details. Whether you are nearsighted, farsighted, have astigmatism or presbyopia, we offer a wide range of lenses to meet almost every patient need. Schedule your annual eye exam with your Vision Source® optometrist to find out if a silicone hydrogel contact lens might be the right choice for your lifestyle. Aqua Clear® allows you to wear the lenses for up to 6 nights and 7 days. Many enjoy the convenience of a daily disposable lens like Fresh Day®. There’s no cleaning or maintenance, simply toss away on a daily basis. My Day® is the latest in silicone hydrogel technology offering even less awareness of the lens. The MyDay® lens is wonderfully soft – softer than other silicone hydrogel, daily disposable lenses – yet they’re easy to insert and remove. 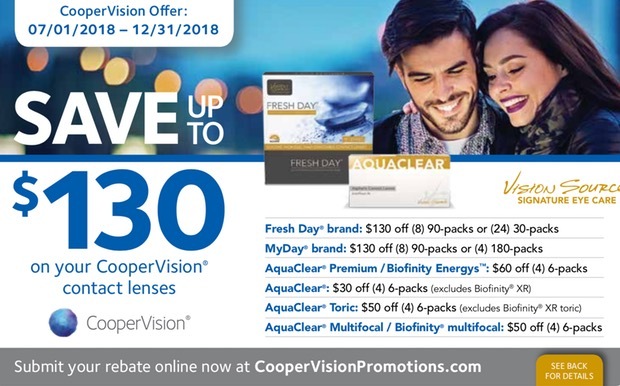 After purchasing your Aqua Clear®, Fresh Day®,or MyDay® contact lenses from a participating Vision Source® optometrist, download this rebate and follow the instructions to either receive a Visa® Gift Card or to donate a portion of your rebate savings to Optometry Giving Sight, an organization dedicated to providing sight to millions of people around the world. See rebate for details. Schedule your annual eye exam with your Vision Source® optometrist to find out which contact lens is the right choice for your lifestyle. Designed with Convenience in mind. Bausch + Lomb offers a complete line of contact lens care products designed to make your lens wearing experience healthy and comfortable. 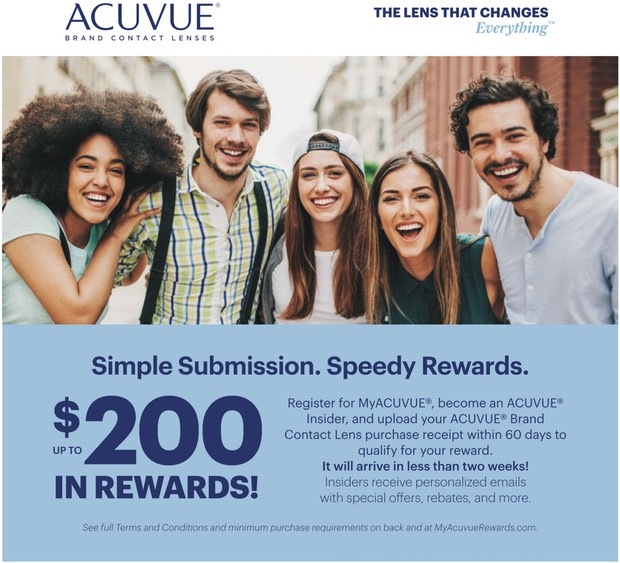 After purchasing your Bausch + Lomb ULTRA® or BioTrue® ONEday contact lenses from a participating Vision Source® optometrist, download this rebate and follow the instructions in order to receive your rewards points. 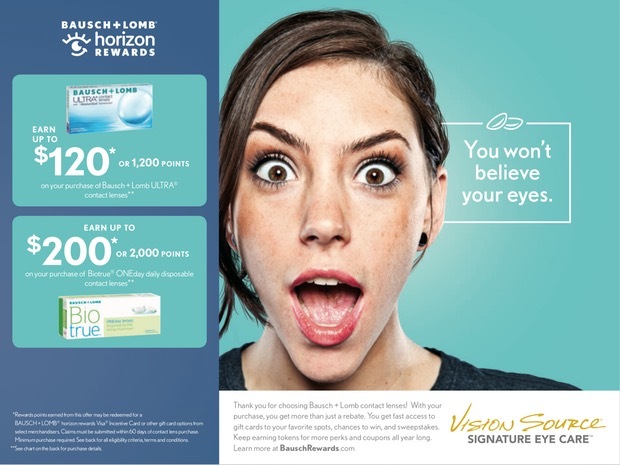 Rewards points earned from this offer may be redeemed for a BAUSCH + LOMB® horizon rewards Visa® Incentive Card or other gift card options from select merchandisers. See rebate for details. Your eyes are our inspiration. We work tirelessly to create contact lenses that work in harmony with your unique eyes, the lifestyle you live and your vision correction needs.After purchasing your Acuvue® vita®, Acuvue® Oasys, 1-Day Acuvue® Moist, or Acuvue® Oasys with HydraLuxe™ contact lenses from a participating Vision Source® optometrist, download this rebate and follow the instructions to qualify for your reward. See rebate for details. Closed daily from 1pm to 2pm for lunch. COPYRIGHT © 2018 SALT RIVER EYE CARE. ALL RIGHTS RESERVED.